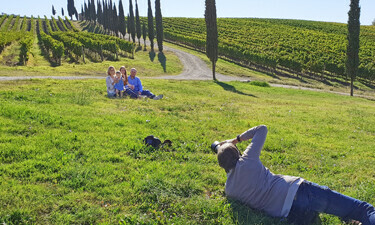 09:15 We set out from Florence (other locations available on request) and head for the Chianti region where we arrive after about forty five minutes, and meet up with our photographer Sandro Fabbrini. 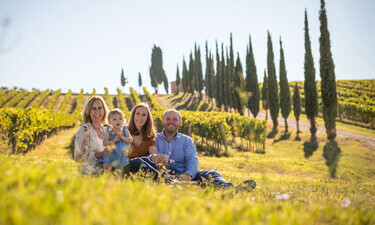 Sandro is the top wedding photographer in Tuscany with thirty years experience. His talent lies in the ability to create perfect compositions of scenery and people, just look at the pictures on this page, or better still look him up on his site. We’ll spend the morning enjoying the Tuscan landscapes while Sandro shoots away. He will take candid and posed shots making you feel very much at ease, he’s done this hundreds of times. Late morning we arrive at Monterinaldi winery from my premium tour, for more photos in the grounds of the estate’s 1800’s villa. Our time with our photographer in Tuscany comes to an end around 01:00, but our day is far from over. We now sit down to lunch at a private table in the winery’s 1800’s villa. It’s a three course feast of genuine Tuscan home cooking…and I really mean a feast! This is your chance to “get away” from restaurants and find out how Tuscans eat at home. Well it’s not really the type of meal we eat every day, I’d call it a special occasion lunch. Your feast will be prepared by Margherita the winery’s resident cook who isn’t a chef…”just” a great cook in the homely sense. Of course this is “also” a wine tour, so during the meal you’ll be enjoying a paired tasting of the highly rated Chianti and Super Tuscan Wines from the Monterinaldi estate. And by the way; I suggest you have light breakfast and forget your diet. After lunch (If you’re not too tired) we’ll have a guided tour of the winery’s 1800’s underground cellars, then around 3:30pm we set back to our accommodation where we arrive at 4:30.